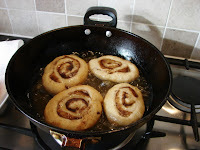 This Cantonese fried bread is one of my favourite chinese bread. 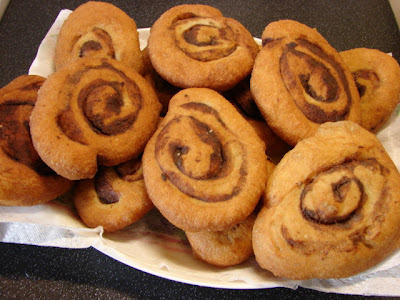 This doughnut is a pinwheel bread spread with a salty spicy mix. It's is spicy, salty and chewy. 2. Leave the dough to rise till double in size. Punch down the dough. 3. 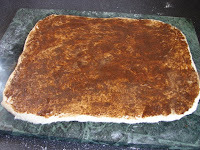 Spead working area with dusting of flour and roll the dough into 13" x 10" square, about 8 - 10 mm thick. 6. Roll the dough up like a Swiss roll. 7. 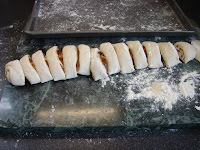 Cut the rolled dough into 13 - 14 pieces. 9. Cover and leave to rise for about 20 minutes. 10. Heat 2 cups of oil in a large pan or wok till quite hot. 11. 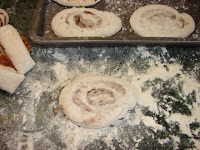 Scope each dough up with a spatula and lower gently into the hot oil. Fry for 1 minute, turn over and continue frying and flipping till both sides are golden brown.